Envirosafe Ireland supply the QC-50 Calibration Gas Bump Tester (850-1050-00). The QCV used in the QC-50 are small, disposable vials with a small amount of the gas to be tested in liquid form in a sealed inner ampoule. Breaking the inner ampoule allows the liquid to absorb into a filter which then diffuses out the gas. Simply squeezing the hand aspirated bulb will allow a test concentration of gas to flow by the gas detector, verifying its operation. 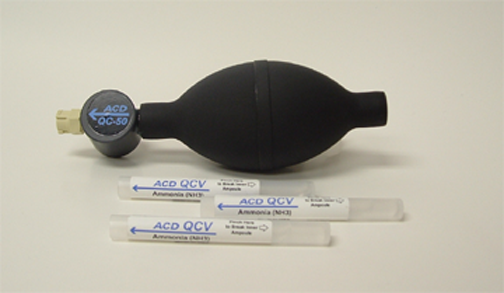 The QC-50 is currently available for ammonia, toluene, hydrogen chloride and hexane.